Phelps | Duncan Platform: Hola! Ni Hao! Jambo! Bearcats, another year of student government leadership is wrapping up and we have much to share with you. Whether it be student advocacy, building unity, addressing campus policy, or building school spirit we have been hard at work this year. Though we were not able to complete each initiative we set out for we are still extremely proud of the accomplishments of student government this year. As we ran for our positions we had dreamt of creating OneUC. OneUC is our vision to manifest unity, equity, and inclusion at the University of Cincinnati. This effort was fostered through oneCommunity, oneStudentBody, and oneBearcat. The message of oneUC brought members of UC together by emphasizing a common bond and promoting necessary opportunities to celebrate differences amongst the UC community. As we worked with administration and students the use of â&#x20AC;&#x153;oneUCâ&#x20AC;? molded into an internal communication tool that signified unity. What this report includes is a culmination of the tremendous work and progress made by our entire student government. We extend our appreciation and gratitude to every member of Senate, Cabinet, Executive Staff, Tribunal, and Board for their continued work throughout the year that has made an impact on the student body. Though all of the work is not able to be included in this report we have tried to grasp as much as possible. Lastly, thank you for the opportunity to serve the student body, it was a sincere pleasure. We have a great appreciation for student government and look forward to what the leadership of the organization has the potential to do for years to come. 5 Convocation Student Speakers Student government partnered with TedxUCincinnati to create a stronger student focussed convocation in the fall of 2016. Members of the UC community had the opportunity to apply and speak in front of all freshmen at convocation. In total, three student speakers were able to share their story and how UC has impacted their lives through a ted talk. The Connect Conference has annually put on by the Women’s Center for a few years, until last year. This year the Women’s Center wanted to bring it back, but they needed a little help, so they asked for funds from many places and Student Government happened to be one of them. Connect is about networking and leadership building, it’s geared to 1st and 2nd year women identifying, or non binary, students to meet with upperclass-women and engage in a variety of topics. The comeback of the event was widely successful and SG continues to work with the Women’s Center to provide valuable services such as this. Awareness for Abilities Week was a student government initiative to destigmatized disabilities around campus. The event was held the last week of March and included multiple student organizations and local partners to spread information and awareness about various disabilities like mental health, speech and hearing problems, blindness, autism, and mobility issues. During this week, showings of the movies Temple Grandin and Theory of Everything were available, both films portraying individuals that overcome the stigma of their respective disabilities. Another valuable program during the Awareness for Abilities Week was keynote speaker, Alex Kovacs. Alex is a local motivational speaker from the Warren County of Developmental Disability Services and provided a very beneficial speech to wrap up the week of events. Elect Her Elect Her is a program run by the AAUW, with the Women’s Center as the party that hosts it on campus and Student Government involved in various ways throughout the year. This year Student Government helped to fund this vital event. Not to mention having many participants in the event and even having SG’s new group, Women of USG, participate in a panel discussion. This program is a success each year and SG’s expanded role this academic year demonstrates the importance weighed upon the event by Student Government. Engage UC was a comprehensive, week-long focus on student engagement to provide students greater access and knowledge of the opportunities available to them at the University of Cincinnati. 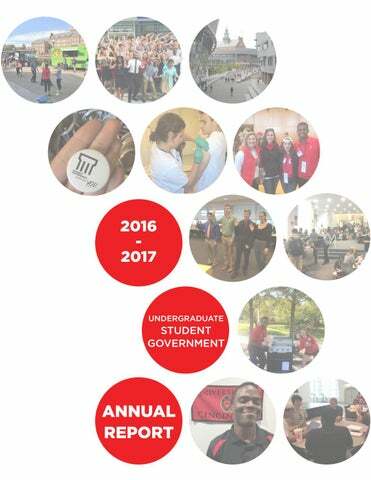 Specifically looking to attract 1st years and those not-yet-involved, Engage UC was a partnership conducted with over 45 partner organizations and centers with 27 stand alone events throughout the week. In the first year of the event, it was widely successful with programing throughout the week well attended and positive feedback received from attendees and organizations alike. SG is proud to have provided all students more opportunities to get involved in this academic year and throughout the rest of their time at UC. WorldFest was an event put on at the University of Cincinnati in early March of 2017. The week of WorldFest is full of activities from all corners of campus and is the single most culturally-embracing event at our university. Planning for the event has taken place since October and our WorldFest committee is thrilled to showcase all of the organizations that are taking part in the program this year. SG hopes that WorldFest will raise the level of awareness to students of all the fantastic students the university has from all over the US and the world. Fall and Spring Career Fairs Every Fall and Spring Semester, the Engineering and Applied Science Tribunal (CEAS Tribunal) and the Lindner Student Association (LSA) collaborate with the Division of Experience-Based Learning and Career Education to host the Fall and Spring Career Weeks. DAAP Tribunal also provided new branding materials for the Career Weeks. In Fall 2016, both the Professional and Technical Career Fairs sold out with a total of 180 companies filling 192 booth spaces in the Campus Recreation Center. In Spring 2017, LSA hosted 151 companies for the Professional Career Fair and CEAS Tribunal hosted 180 companies for the Technical Career Fair. Notable companies that attended this past year are GE, P&G, 84.51˚, Toyota, Marathon, Luxottica, Johnson & Johnson, Gulfstream, and Kroger. These career fairs are a major asset to students, giving them opportunities to polish their soft skills and talk to many employers searching for co-op students or interns. SG is proud to help with career fairs each semester and excited to continue to make it easier for UC students to gain professional experience during their time in school. DAAP’s first Career Fair In the fall of 2015, SG reached out to the Division of Professional Practice and Experiential Learning (ProPEL) for help planning the College of DAAP’s first ever college-wide “career fair” to provide design discipline students a new hiring opportunity. DAAP is one of the premier undergraduate design colleges in the nation, and SG saw the need for highly talented students to get traction in the job market beyond relying on solely their portfolio and resume. Through face to face interaction, discussion panels, and even collaboration on service projects, hundreds of students discovered what awaits them in the design world outside of academia and fifty employers learned what makes DAAP a college full of premier programs and fantastic students. All Sports Nights These are designated games (chosen by the particular team that is playing the game) that are intended for all students to attend. UC Department of Athletics’ Student Athlete Support Services coordinates with the Student Athlete Advisory Committee to encourage students to attend these events. Student Government provided the graphic for each of these events. In addition, Student Government promoted the graphic made and game information on social media. The promotion of the events by SG helped to raise the attendance at these sometimes underappreciated sports, helping to cheer on our athletes of all sports. The Make Your Mark mural design contest was presented by the 2015-2016 Student Government. Designs were reviewed by the selection committee consisting of student representatives, UC Planning + Design + Construction, and UC Communications. After many years, the often used, but drab looking, staircase received its long deserved beautification. A $250 UC Bookstore gift card was awarded to the student, Alyssa Gardner, with the winning design. Students now walk past this mural each day and are reminded of the help of SG to enhance the student experience at UC in many ways. Student Government had the opportunity to work with the UC Department of Athletics, RallyCats, and Student Athlete Advisory Committee to have a pep rally on MainStreet before game-day. The goal is to reach as many students as possible and get them excited up for the game that weekend. Along with participating in these spirited rallies, Student Government assisted with button purchases for each game. Buttons were designed based from the specific game that week and intended to add to students’ spirit-wear. Thanks to the Student Life Committee operating fund, SG was able to collaborate with other organizations to help raise excitement for UC Athletics throughout campus. National Girls and Women in Sports Day This day is intended to promote women’s athletics in the community and was split up into 3 parts. The first session allows for girls in CPS to join varsity, UC female student-athletes during a game day. The second session is split into two with girls from CPS attending a panel and varsity while UC female student-athletes and women in the community attend a separate panel. The last piece ends at the UC Women’s Basketball game. Student Government, along with other student-spirit organizations, helped in the planning and promotion of this event. In addition, Student Government leaders were invited to attend and assist with the panel, seeing another successful year for this event. #OscarWatch In its second year, RallyCats asked other student organizations to partner with this event. It is named “Oscar Watch” because the students’ aim to “watch” the Big O and Bearcat statues on campus, protecting them from Xavier students looking to prank UC before the Crosstown Shootout. The event is intended to unify UC students before the famous rivalry game on campus. Of the various student organizations that participated, Student Government assisted in the promotion, logistics, and funding of this event. After a bill was passed, Student Government purchased promotional “Oscar Watch” shirts for all students who attended this event, helping to raise the attendance of the event and continue to excite the student body around university traditions and athletics. OUTREACH Phelps | Duncan Platform: We the Bearcats In most cases, individuals with the best ideas on how to improve the student experience are the students themselves. We The Bearcats is an initiative to bring individual voices in the student body back to student government. Through the creation of an online petition process that utilizes CampusLink, We the Bearcats has given students the ability to directly petition their student government representatives to make real and tangible change in our university. SG has been working hard to create a robust, sustainable and easy-to-use process so that the interests of students are heard by our student senate, student body president and vice president, and by the university’s administration. “Bearcountability,” the first petition to use the process, helped create changes to student governments bylaws and budget oversight so that student funds are used in an efficient and impartial manner. Student Government appreciates this increased outreach with the student body and hope to use WTB in the future to engage with issues of concerns for all students. Course Evaluations have not traditionally had a high rate of completion because students often perceive them as feedback that is not utilized by faculty and administration appropriately. However, Course Evaluations do hold a great deal of importance in terms of appointing professors, keeping programs accredited, and more. Student Government resolved to help address this misunderstanding by promoting Course Evaluations to campus. In the future, SG intends to work with faculty and administration to provide more transparency with how they utilize the feedback from Course Evaluations. On October 5, 2016, Student Government collaborated with the LGBTQ Center for ‘Back to School Cookout’, serving up grilled hot dogs from SG and groovy music featuring chips and drinks from the LGBTQ Center. This was an event intended to bring the members of Student Government to interact with the students on Sigma Sigma Commons, giving a face to the organization. Attendance was high and we ran out of hot dogs to serve within two hours. People were showing great interest in learning more about Student Government as the SGers were discussing with students. Needless to say, it was a successful event and one that greatly benefitted the awareness of SG on campus. Big Red Bearcats Mentorship Program The Big Red Bearcats Mentorship Program is a small scale mentormentee style program in which students at UC pair with students from Hughes High School. So far the program is in its first full semester of activity, with the 13 pairings lead by four directors. This mentorship program is meant to create a long-lasting bond between the mentee and mentor, teach life skills, the values of team building, and education. As SG looks forward, thoughts of turning BRB into an official campus organization presents itself, but for now we remain a volunteer based program solely dedicated to the growth of Hughes High School students. International-focused body positivity table with the UC Women’s Center’s Love Your Body Week The event was based on spreading awareness of body image and perceptions across the globe. The normalization of the Western body image is very problematic and this transcends into a racial/ cultural issue because of the globalization of these ideas. SG had conversations and engaged with more than 100 students and had a craft table for people to make body-positive buttons. Several students took selfies with the body-positive quotes that SG used to market the tabling events. SG was happy to provide this addition to the Love Your Body Week, continuing the partnership with the UC Women’s Center and extending programming to our international students. Many people at UC aren’t fully aware of everything that student government does - and for good reason: it is confusing. There are multiple branches of student government, each having many positions. The tabling project was started last year to help interface with the student body and raise awareness for what student government can do for students. Continuing this year, periodically a different group within student government tabled on Mainstreet to communicate with and meet students. Near the end of the year, about 1,000 gloves were purchased to give out to students during tabling. In the future, the gloves will continue to be handed out to students to build a better relationship and start conversations about student government. UC Farmers Market (UCFM) held its first event on November 3, 2016 in TUC Atrium. Seven vendors were in attendance with a variety of local food and goods including fresh produce, humus, granola, olive oil, baked goods, and hand-made rope vessels. UC Sustainability was also there passing out reusable water bottles, and some students played live music. Reusable bags branded with UCFM were given out to encourage the reduction of plastic bag usage for grocery shopping. The turnout was great, and many people expressed excitement for future events. Overall, it was a successful event for both the vendors and the attendees, and there are more markets coming to campus in Spring 2017. The 2016 Sustainability Summit was held at Hueston Woods State Park from September 9-11th, 2016. With over 50 attendees, graduate and undergraduate students gathered to learn about economic, social, and environmental sustainability from guest speakers and fellow students. There were three keynote speakers: Chris Clements, Executive Director of Imago; Rob Richardson, Chairman of the Board of Trustees of UC; and Brian Taylor from Black Lives Matter Cincinnati. The 2016 Sustainability Summit successfully engaged students, and groups were formed to start UC Farmers Market, UC Solar, and the plastic bag initiative on campus. Plastic bags will no longer be available at Catskeller after Spring Break 2017 as a pilot program for reducing plastic bag consumption on campus. There are future plans to implement reusable bags for purchase in the campus bookstore and other retail locations. This initiative is tied in with an overarching sustainability campaign combining Student Government and UC Sustainability, part of Planning + Design + Construction. Through this, SG aims to greatly reduce the environmental footprint of UC students and staff to protect and keep Clifton beautiful for years to come. 13 SG Shine the Shoe In support of the University’s continuing mission to benefit the Greater Cincinnati community with outreach to Hughes-STEM High School, Student Government donated a total of $1,600 to two student-led programs benefitting Hughes High School students through completion of Shine the Shoe and a donation matching partnership with the Center for Community Engagement. The first program is the Big Red and Black Program which establishes schoollong mentorship for Hughes students from UC students. The second program is the Big Red Science Fair, the first Science Fair for Hughes High School, which provides students with handson experience and support in the science fair with the opportunity to participate in the largest science fair in the region at stake for the top three contestants. Student Government’s donation provided more than double the financial support these organizations have on their own. With matters of sustainability as a top priority for students, Student Government partnered with UC Sustainability to create door hangers with a how-to guide on reducing the carbon footprint of students in residence halls. They were distributed at the beginning of the Spring Semester to each residence in order to educate all students living on campus on simple practices we can all take to leave a smaller impact on our environment. After each home game for FC Cincinnati, UC Sustainability, Sustainability Advocates volunteer to pick up the recyclable items left in the stands, to save them from being placed in a landfill. Student Government partnered with UC Sustainability to clean up after 3 games over the 2016 season for FC Cincinnati. With Student Government’s assistance, UC Sustainability was able to greatly increase the reach of their recycling efforts. Phelps | Duncan Platform: Mental Health Ambassadors Student Government recognized the importance of advocating for mental wellness on our campus and for creating an environment that supports students who face mental health struggles. This led to the development and implementation of a new Mental Health Ambassadors program for students across the university. Selected from over 200 applicants, the 30 ambassadors which make up the program are champions of mental health, many with very personal connections to mental health concerns. Trained in coordination with Counseling and Psychological Services to function as a peer support system, the ambassadors currently offer more than 40 weekly hours of judgement-free discussion for students in need. The ambassadors also serve as Connectors during conversations, bridging the gap between different on-campus resources that students can use to support their mental health. Mental Health Ambassadors have also served as Coordinators on campus, and have worked to develop on-campus stigma reduction and mental health advocacy events. The ambassadors have also paired with other on campus organizations and offices, including To Write Love on Her Arms, Project Heal, and the Office of First Year Experience and Learning Communities.With the First Year Experience office, ambassadors have helped to integrate mental health discussions into the freshman Learning Communities. As the Mental Health Ambassadors continue their tireless work, this goal is slowly coming to fruition as their efforts begin to reshape the narrative at our university. #MentalWellnessWeek #UCStrong This fall the Undergraduate Student Government teamed up with the Campus Recreation Center and University of Cincinnati Foundation to put on #MentalWellnessWeek. Under the #UCStrong initiative, the Campus Recreation Center hosted a week long event that promoted mental wellness across campus. Student Government was also able to promote the #UCStrong initiative through handing out buttons and promoting the brand new Mental Health Ambassadors. Mental Wellness week concluded with the annual Warrior Run and a Mental Wellness banner being unveiled at a Cincinnati Bearcats football game. The Memorandum of Understanding between SACUB, GSGA and SG was the driving force to ensuring student voices were heard during fee development. The MOU describes at length the function of each organization and assigns SACUB as the body to oversee fees to the student body, and the process to do so by. Through this MOU passed in December of 2016, SACUB has seen over 10 proposed student fees for proposal, more than there was presented to any student group in the 2015-2016 Academic Year. Often, Student Government lacks the means to authentically take into consideration the thoughts to every student at UC. The We the Bearcats Polling System provides the members of Student Government the platform to reach out to students to fill this void. We the Bearcats does so by having students propose questions on a survey linked to email distribution to all students every month. 50 students from The University of Cincinnati Undergraduate Student Government travelled to the District of Columbia for a weekend of discussion on current campus related issues. The students departed early morning on Friday, July 27, and arrived back in Cincinnati late on Sunday, Aug. 1. The discussions were facilitated through the National Campus Leadership Council. Topics covered were mental health, campus sexual assault, diversity and inclusion, and strategic planning. Topic content was described as “intense” and “heavy”, but a post trip survey revealed an “extremely satisfied” sentiment about the overall experience. The facilitators from NCLC, former student body presidents or vice presidents of their respective schools, used personal experience to detail how they confronted these specific issues on their campus. The retreat was pivotal for an organization as large as Student Government to build into ourselves to be the strongest representatives possible for the Undergraduate Student Body. 16 Women of USG Women of USG is an inclusive, non-partisan, student-run group that fosters a space for growth and support through programming and policy decisions that affect the women of USG. SG is stronger with a variety of perspectives, including those of women. Through intentional community with the purpose to strengthen each other, Women of USG hopes this will be a sustainable method of confidence-building. Women of USG was created in November 2016 and has since hosted a few programming events to foster relationships; a workshop with Dr. Jane Sojka, teaching women how to be empowered not only in the workforce, a holiday get together full of relaxation and snacks, and a Galentineâ&#x20AC;&#x2122;s Day Brunch. Currently Women of USG is working towards an initiative to provide free menstrual products in all restrooms on campus. SG Cohesive Branding One of the largest initiatives of the Design Directors for the 2016-2017 school year was to create a strong and consistent brand to be used by Student Government. Guidelines were created outlining the approved logos, colors, typefaces and general style to be used by all SG members and on any materials produced by the organization. The consistency of branding serves to increase recognition across the university; presenting a powerfully recognizable brand. As the reach of Student Government grew throughout the year, so did the new cohesive branding, which assisted in illustrating to students all that Student Government does throughout the year. Student Government Accountability This year, to increase accountability the Director of Accountability solicited responses for two surveys to benefit student governmentâ&#x20AC;&#x2122;s internal operations. This fall, one survey asked for general perceptions of members on the various bodies within SG: the whole organization, senate, and the executive team. This information was presented to the executive team and with over 50 responses, they found this presentation of results valuable to improve communication, transparency, and accountability for SG in the winter and spring. For the spring of 2017, another survey asked members to share the accomplishments they achieved within their position. This survey was helpful for members to outline their successes and struggles in the year along with compiling initiatives as a historical record, which can now be accessed by position holders in the coming years. 17 “Hot Off The Prez” “Hot Off The Prez” is an internal student government weekly newsletter, a concept that had not been executed before in recent years. In the newsletter, President Phelps wrote a reflection of the week and gave advice to fellow SG members. It also included mental health tips and a spotlight section to highlight specific accomplishments of SG members in that week. This increased communication was one of the goals of President Phelps and greatly assisted in transparency of the organization along with better informing members on the activities of parts of the organization they may not engage with frequently. The previous version of the Student Government website was full of out of date and often inaccurate data. Not to mention being hosted on an old UCIT system, which meant SG’s website was far from what it should have been. For this project the Web Director worked with SG Exec, the Board Presidents, and Tribunals to get the most accurate information possible onto the new website. The Director also worked with various UC and UCIT Administration to get SG’s website moved onto the Adobe CQ5 system used by every other university website and in compliance with UC web design standards. Not only did this redesign realign SG’s branding with the rest of UC, but it added vital information to help make SG a more accessible organization to all interested UC students. This year, Student Government aimed to create a refreshed mission and vision statement for our organization. Through this we hope to enhance the focus of SG as included in the formalized remarks below. 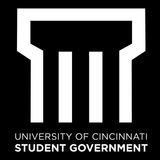 Mission Statement: The Undergraduate Student Government is an elected and appointed representative body of students who continually address the needs and concerns of the undergraduate student population at the University of Cincinnati. Vision Statement: Lead for the benefit of student interests through legislation, programming and promotion, and inclusion of the student voice, to enable the positive and equitable well-being of the undergraduate student body. Focus groups were held at both UC Blue Ash and UC Clermont to review resources available to transition students and where there could be for enhancement and growth during 2016-2017. These focus groups reviewed the online orientations for transition/ transfer students and gave critiques about where there could be improvement. It also focused on general questions/ complaints that students had about the transition process. This information was invaluable in providing insights into how SG could better enhance the experience for our students outside of Clifton. This year, there was a survey sent to all current UC Blue Ash and UC Clermont students, which questioned transition students on their experiences going from a Regional Campus to the Uptown Campus and where there was room for improvement in that process. This survey concentrated on the previous transition process and gather feedback on what should be altered. This feedback went towards the creation of an orientation specific to transition students. Which in turn, led to the formation of an app that provided additional support to transition/transfer students. This survey was formed with the assistant of Institutional Research and the Pathways Center for Student Success. In general, the information that was collected was compiled to be more specific to UC Blue Ash and UC Clermont students to provide more support and resources. This year the Student Government executive team worked to find a member of the Clermont Campus community to attend and be a voice in Student Senate. They were successful in finding someone that is excited and willing to be apart of our organization and a voice for Clermont College. Student Government also held a Meet & Greet at UC Blue Ash to talk and connect with current students. Through the conversations held, additional direction was given for the route Student Government should take to contribute to the support of transition students. These conversations were a big asset in SGâ&#x20AC;&#x2122;s attempts to better connect with our satellite campus students, who have been too often overlooked in the past. The dialogue provided great benefit to Student Government, but also to our students from UC Blue Ash who provided great feedback for the initiative. At the beginning of the school year, University Funding Board made the transition from paper to online budget submission. The entire funding request process now exists on CampusLINK, giving student organization leaders greater ease of access and a much less archaic way to request funds. Since then, UFB has been able to distribute the entirety of its yearly allocation to student organizations. This year UFB funded 83 organizations for a total of $259,718.60. These funds allowed for 111 events to take place, in the forms of programs on and around campus and conferences across the nation and abroad. Throughout the past year, Student Safety Board has seen a year of growth and change for the board. This year, SSB has begun a hands-only CPR initiative through the American Red Cross The organization came and taught all members hands-only CPR and how to spread this life saving skill on to other students and organizations, something that will allow SSB to teach this skill to Learning Communities at UC starting in Fall of 2017. Last spring Student Activities Board successfully transferred to a new online system for organizations. Although we are still using the name CampusLink, we made the transfer from CollegiateLink to OrgSync with minimal technical issues. This system offers many new and improved features for students including an online budget system and an improved user-friendly setup. UFB has also worked extensively with the Student Activities Board (SAB) to move the student organization registration process, known as RESET, online, also through CampusLINK. Currently, both Boards are collaborating to make the training even more streamlined and informative than ever before. Another initiative SSB created was the Student Organization Awareness Program (SOAP), an informational presentation that covers crime safety and prevention, fire safety, alcohol awareness, safety resources on campus and other aspects of student safety experience at UC. A narrated version of this presentation has been created and is required for all online renewals of student organizations. It is also delivered in person at RESET presentation for SAB and can be requested by any student organization to have members of SSB share this presentation to the members. Student Activities Board, in conjunction with University Funding Board, also conducted its first feedback survey for organizations. The feedback was well received and assisted SAB in discussion into improve student involvement and the student experience at UC. Lastly, SAB improved our educational programming by adding â&#x20AC;&#x153;Lunch and Learnsâ&#x20AC;? to our calendar of events. These workshops help organizations build knowledge around relevant topics such as event planning, assisting participants to transfer the information into success for their organizations. The CAHS Tribunal is holding the Second Annual Dinner in the Dark this spring; a delicious pasta dinner while blindfolded to experience dinner from a new perspective! The meal will also be followed by a presentation from the Cincinnati Association for the Blind and Visually Impaired (CABVI). Students are invited from across campus to experience dinner from the perspective of visual impairment. The goal is to bring awareness to those in our community that are visually impaired and to raise money for CABVI. Arts and Sciences tribunal will be proud to host McMicken Week again this April 3rd-7th with events helping promote career services, networking opportunities, pre-professional experiences, and collaboration between A&S organizations. Other efforts this year include revamping the bubble soccer rental process for other student groups and increasing crosscollaboration between A&Saffiliated organizations by creating roundtables to discuss similar issues and solutions with students across the A&S spectrum. This year CECH Tribunal has celebrated all of the bright, hardworking, and compassionate students that make up the wonderful college with free food and community! Celebrating the students within the college was a goal to cultivate unity amongst the college. After UFB ran out of money last year, CEAS Tribunal set out to fill-in where UFB could not. Seeing as the tribunal has a substantial amount of money due to the continued success of the Technical Career Fair, CEAS Tribunal decided to cosponsor engineering-based organizations that meet our criteria. This especially helped organizations that had plans to use money they would have been otherwise allocated. The tribunal was proud to engage more with engineering organizations and fill the void in funding their various activities. Besides helping with DAAP’s first career fair, DAAP Tribunal’s big event Spring semester is DAAP Makers Market. The goal is to make this an annual event and going into its first year has 45 vendors. This event is engaging students, alumni, professors, as well as the University of Cincinnati and Cincinnati community. With a low table cost for alumni and professors, and no fee for students, it is a great way to bring the design community together and to encourage entrepreneurship within the college. This is one of the many new strides that DAAP Tribunal has made during the academic year and the group intends to continue to find creative ways to engage UC’s students. LSA’s main initiative this year was to figure out the best way to interact and assist the other Lindner Organizations. We want to better represent the students of the College of Business and the first step is to better interact with the student organizations. They are already serving a different pool of students in a specific way that is unique to that particular organization. We have started looking into a grants program and umbrella organization program. Through trial and error, we are starting to create a strategy to better collaborate calendars, distribute resources, and communicate effectively among the different organizations within the college. With also working with the administration, we will be able to solidify that process before the next fall semester. Nursing Tribunal set out with a goal to provide 150 free flu shots to UC’s students this past fall. Third and fourth year nursing students administer the vaccination with the supervision of clinical instructors, allowing for the nursing students to refine their skills and give back to the UC community. Within a three-hour period, the students administered 180 flu shots! This service helped benefit student’s skills but also allowed students of all backgrounds to receive a free flu shot, an important need during the winter and early spring. The Nursing Tribunal hopes to grow this event and reach even more students on campus in the future with the further help of SG and helping to battle flu season even more in the future. ELECTIONS FACILITATION COMMITTEE This year, Elections Facilitation Committee (EFC) aimed to continue to improve the ways Student Government’s leaders are elected each year. One way was in increased transparency with all documents , statements and reports by making all available to candidates, their teams, and students on EFC’s fileshare system. Additional polling stations will be added throughout campus to raise more awareness to elections and ensure that all students may have more accessibility to vote. In addition, EFC has aimed to increase accessibility to events during campaigning by livestreaming events, such as the Diversity Discussion and Town Hall meeting. Lastly, the committee hopes to provide a better structure to the Town Hall meeting this year, ensuring that students can better hear the differences in platforms between all candidates and slates and feel confident when it comes time to vote. SEXUAL ASSAULT PREVENTION Red Flag Campaign The red flag campaign was brought to UC to raise awareness around signals of unhealthy relationship, known colloquially as ‘red flags’. SG felt that this campaign demonstrated the most inclusivity, showing that unhealthy relationships can be a part of any student’s life. The Women’s Center was a major contributor in this event and SG continued to build a strong collaborative relationship with the center in other programming during the semester. Tim Mousseau is a nationally known sexual assault prevention speaker. In the Fall he was invited by the University of Cincinnati Student Body Government to come speak to our student body. SG worked in collaboration with Athletics and Greek Life to set up a session for Tim to give his talk called “Ending Sexual Assault Through Everyday Conversations.” These talks help raise the level of discussion about Sexual Assault Prevention on campus, a cornerstone of SG’s focus during this year. This year, Student Government recognized a need to improve the communication between the resources provided on campus for sexual assault survivors and students. Several SG members and senators joined in working to get these resources listed on syllabi, as it would then be part of each class at the University. SG is excited that steps have been taken to encourage faculty to assist in preventing sexual assault in this way and SG will continue to push for a formal resolution in faculty senate to continue these efforts. Accessible Gender-based violence and sexual assault training Student Government and the Women’s Center has created an open communication dialogue to start the first steps towards a safer campus for students with disabilities. In the future, SG hopes to work with TAP and other students with disabilities to create a more accessible environment while discussing gender- based violence and sexual assaults. Contact with TAP and the Disabilities Service Office has been made and hope to build upon into the coming academic year. Increasing availability of these services is crucial in providing important trainings to Bearcats of all backgrounds. Despite efforts to foster local talent, only 6 percent of the 2015 incoming class came from Cincinnati Public High Schools. In order to truly foster a culture of inclusion Phelps | Duncan partnered up with Hughes high school ‘After Hours in the Tower’ bridge after school programs to build into the future of the City of Cincinnati. This is a volunteer based mentor and tutoring after school program. With this initiative Student Government was able to showcase of objective of creating #oneCommunity. Roughly 1015 members participated in the fall semester with a total of 75.5 hours of volunteering completed. The uptown area surrounding our university falls under the jurisdiction of several community councils. These councils vote on relevant decisions affecting the areas where students live. This year Phelps | Duncan built a relationship with Uptown Consortium to show our dedication for partnerships with the surrounding community. Campus Life Committee was able to work with the community on different initiatives and gaining a respect for the student voice off campus. Donate a Meal Swipe This past fall 2016, Bearcats had the opportunity to give to other Bearcats with a program called the Bearcats Pantry. The Bearcats Pantry is a food pantry on UC’s campus for students who can’t afford to buy groceries and other essentials. The Pantry partnered with Campus Food Services to create a Meal Swipe Donation Program that allowed anyone with an on-campus meal plan to donate a guest swipe that will be transferred into a food voucher for a student in need to enjoy a free meal in one of the dining halls. Student Government specifically helped in the planning and provided all volunteers for the donation drive. In total Student Government with the partnership of Food Services, Student Affairs, the Bearcats Food Pantry collected 429 Meal Swipe Donations! Just before the end of Fall semester, Student Government was approached by Enterprise Risk Management about the university’s desire to get a better handle on where and under what conditions students are living off campus. Current resources include are Facebook housing pages and the Off-Campus Housing Portal, but these can only tell us so much about everyone’s living situations. As such, Student Government and university administrators teamed up to launch a survey that hit roughly 500 students and will be used to start and inventory of offcampus housing options and build a “rate-my-landlord” system to help students understand the housing situation they would be entering before they start their lease. Data is currently being compiled and SG hopes to further these projects in the coming years. This fall President Phelps sat on the search committee to find the next President of the University of Cincinnati. He was the voice within the committee for all undergraduate students. In that role he took it upon himself to bring the student feedback to the search committee. A student feedback session, alongside a survey was sent to all undergraduate students to adequately provide the student voice. Student Government is thrilled with the selection of our 30th President of the University of Cincinnati, Neville G. Pinto. Within his first week on campus he held a breakfast with SG to gain insight into the pulse of the student body. Phelps | Duncan Platform: You’re Late! Everyone knows that the cost of college is overwhelmingly high, and the opportunity for scholarships after you have been admitted can be hard to come by. Phelps | Duncan teamed up with the Offices of Enrollment Management, Student Affairs, and the Ethnic Programs and Services to take a critical look at scholarships and where the most impact could be made. After examining the current offerings, Phelps | Duncan noticed a lack of scholarships going towards students that are passionate about equity and inclusion on our campus. Thus, student government was able to work with the office to allot a sum of funds to go towards the Turner Scholars Program. Specifically to students that are not admitted to the program when they apply to the University. Roughly three to six scholarships will be opened up for students to apply for through the Turner Scholars Program for returning sophomores or above. This initiative was also benchmarked off of the Honors Program to create consistency for continuation scholarships. The announcement of this will be officially made at the Gala on April 22, 2017. Students are expected to arrive at class on time, but the student code of conduct does not have a procedure outlining what to do when teachers don’t come to class. In order to create equal accountability, Phelps | Duncan worked with GSGA and Faculty Senate to make a recommendation to have departments include addressing ‘late to class’ on syllabi. Tribunals within Student Government will also be speaking with departments and deans to make sure this issue is addressed. The purpose of this initiative is for students to go to the ballots on Election Day without the worry of schedule conflicts, such as a busy class schedule or leaving crowded polling sites before having a chance to vote in order to make it back to class. Reducing obstructions is a critical step in increasing voter turnout, and university policy should not add additional obstacles, according to the bill. Canceling classes on Election Day will help the majority of students exercise their basic right to vote, and give them the opportunity to vote regardless of whether they do so in Clifton or their hometown. SOCIAL JUSTICE DREAMzone Ally Training DREAMzone Ally training is an awareness and advocacy training aimed to educate our community about undocumented and DACA students. This workshop from EPS is open to any organization upon request. In addition, the Office of Ethnic and Cultural Affairs holds semesterly workshops for it now. Student Government was proud to have participated in the training, so that members would be able to better represent all students at UC. DREAMzone training is an important way to educate students on a challenging topic and SG was fortunate to participate. Microaggressions In Everyday Life Student Government partnered with the Office of Equity & Inclusion to host Derald Wing Sue on campus for students to learn about microaggressions in everyday life. Specifically addressing this issue within race, gender, and sexual orientation. Phelps | Duncan Platform: Hola! Ni Hao! Jambo! According to the 2015 Student Fact Book there are 3,103 international students at UC, and the university expects this number to grow to more than 5,000 by 2019. As this fact remains true Phelps | Duncan were in conversations during the duration of the year on how to make a space for international students a reality. After realizing the University had no funds to push through with this, Phelps | Duncan kept insisting that it be on the agenda for the Planning, Design, and Construction office to address. Phelps | Duncan hope the work towards creating this space continues into the next leaders of Student Government. Jennifer Baumgardner: Activist in Residence Jennifer Baumgardner is a renowned activist, specifically for gender and sexuality. This year the group ‘1 in 3’ intended to bring her to campus, with the Women’s Center and LGBTQ Center agreeing to host the number of events. Baumgardner was at UC for three days; leading two workshops, participating in a film screening, having a keynote address, hosting a lunch, and finally a book signing. None of it would have been possible without the help of additional funds from Student Government, another way in which SG provides programing to all Bearcats and striving toward the goal of OneUC. The extraordinary talent of our nationally recognized CCM students should be shared with our entire student body. Phelps | Duncan worked with CCM Tribunal and Bearcast Media to collect student music to be played in different spaces on campus. As promotion and collection is still ongoing, Phelps | Duncan is hoping for the music to be played on campus beginning at the start of summer 2017. Within Student Government members try to push forward initiatives in the past that sometimes take a little more time. This year Phelps | Duncan was able to work on bringing back the ‘CatCar’ idea from the Beer | Shah presidential era to aid in a request students kept asking for over and over. After speaking with President Davenport, she was able to allot a President’s Award for Student Success in the amount of $16,000 to go towards the purchase of a Bearcat golf cart to be used to transport disabled, injured, or students requesting assistance to traverse the UC campus. Phelps | Duncan have worked with the offices of Transportation, Public Safety, Disabilities, Student Affairs, and Risk Management to discuss the capacity of where the CatCar Progam will be housed. Unfortunately no departments at this time are able to house the program therefor SG plans to have a pilot program fall semester to see if this idea will work and be necessary for campus. For a couple years, various groups have wanted to create an app for students to use to better navigate on campus. UC has a particularly confusing campus which can be made even worse when inclement weather strikes or when one must navigate it using a wheelchair. The Smart Walk App aims to be a way for students to choose two locations on campus and have directions for the most efficient path between them. If the user requires routes without stairs the app will present, the best route to take for that as well. The application is currently in development, and most of the campus has been mapped out. This app will be a great benefit to Bearcats of all abilities as SG strove towards the goal of OneUC during this academic year. UC does many great things but there is one thing it is lacking that could bolster its business connections, student experiences and opportunities, marketability, and competitiveness. UC needs a Makerspace. A Makerspace is a location where people of any background can go and make things - for business, their passions, school, or more. It has tools and technology ranging from woodcutting supplies, sewing, 3d printers, or anything else used to create. Other schools have these spaces and the administration is working to find a place for this space on campus. It is a difficult challenge that will require a lot of collaboration and planning, but one that will ultimately greatly benefit the university. BTS Shuttle Stop in OTR Logistics and route layouts for the Rhinegeist OTR stop are currently being developed. Student Governmentâ&#x20AC;&#x2122;s Director of Transportation has been working with the Bearcat Transit System on this new route and stop. The expected debut is mid-to-late August 2017 as the University plans on hiring additional drivers in the future in addition to formatting the specific details of the FS17 route. Rhinegeist will be a wonderful location due to it also being a stop for the Cincinnati Bell Connector (Streetcar). This location provides convenient, safe and affordable transit from the University to downtown and is a gateway for students to explore the city of which our University bears the name. On Tuesday, November 15th, 2016, the Governmental Affairs Committee hosted the The 10th Annual Student Government Governmental Affairs Summit: An Exploration of Civil Engagement Between Elected Officials and Their Communities in Nippert West Pavilion. The Governmental Leadership Summit has traditionally been an evening for members of the University of Cincinnati, the City of Cincinnati, the state of Ohio, and other community allies to come together to celebrate and cultivate leadership. This year’s event featured an engaging panel discussion on civic leadership featuring Ohio House Representative, Catherine Ingram, Vice President of Governmental Relations & University of Communications at the University of Cincinnati, Gregory Vehr, and Cincinnati City Council Members Charlie Winburn and P.G. Sittenfeld. President & CEO of the Greater Cincinnati/Northern Kentucky African American Chamber of Commerce and Former Ohio State Senator, Eric Kearney, delivered the keynote speech. Over the course of Fall semester, multiple events were held around campus to make sure that students were aware of candidates for office and educated on key issues on the ballot. The Governmental Affairs Committee and the Campus Election Engagement Project, otherwise known as CEEP, were able to make sure that students also knew how to vote and what they needed to do to make their voting experience as simple as possible. In addition, Student Government worked with numerous outside organizations and hosted them on campus during the election season. This collaboration with outside groups continued to raise the level of political awareness on campus during an important election year, one of the main goals of CEEP. Women of USG Advocate at the Ohio Statehouse #IgniteChange On February 16, 2017 The Women’s Fund of Central Ohio led a day to ignite change bringing the community together for a day to educate, motivate, and advocate by applying a gender lens to public policy. Three women of USG were invited to attend the #IgniteChange conference in Columbus with the Women’s Center and other UC students. Over 350 people came to the Ohio Statehouse to look through a gender lens at issues impacting women and girls. Using a gender lens means examining a particular issue with a focus on the real life conditions of women and girls— and acknowledging that gender is a powerful predictor of experience and opportunity. The day was filled with new experiences and offered an opportunity to hear new perspectives. Streetcar Expansion Support Student Senate approved to support UCâ&#x20AC;&#x2122;s Student Government getting behind a non-partisan, alternative transportation option, the Cincinnati Bell Connector in October 2016. Streetcar Expansion will benefit US students with opportunity to access affordable, safe, reliable, and environmentally friendly modes of public transportation. The Cincinnati Bell Connector will bring economic development, an increase in employment centers, opportunity for co-ops, and ultimately student ridership if it were to be expanded. Our resolution only further backed the Streetcar support in the City of Cincinnati. Generation IX Summit Student Government was able to send two representatives to the Generation IX Summit November 2016. The summit was sponsored by the Ohio Department of Higher Education as part of their Changing Campus Culture initiative. University of Cincinnati SG was able to share positive, negative, challenges, and opportunities in regards to working with administration around gender-based violence on campus. The workshop focussed on lessons from the groundstrategies to engage with campus administration where and when obstacles/challenges arise.